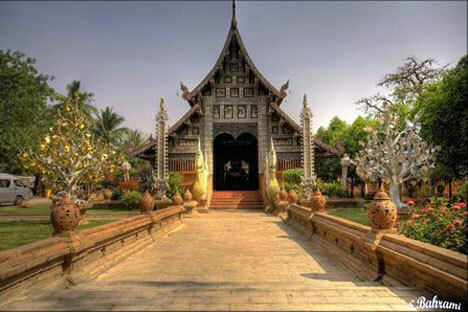 The Kingdom of Thailand is one of Southeast Asia's most romantic honeymoon destinations. Whether you seek seclusion on a pristine tropical island or the excitement of experiencing a new culture, Thailand has something for everyone. The cultural and geographic diversity means you can go from coral reefs to looming mountains in a matter of hours. Big cities like Bangkok and Chiang Mai are bustling with life at all hours of the day. 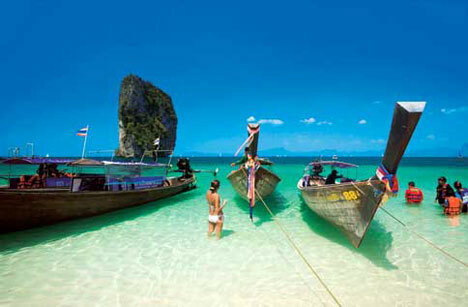 But there are also many opportunities to escape into the Thai jungle or get lost on long white-sand beaches. Such tranquil spots are the perfect choice for a romantic honeymoon getaway. Known as the "Rose of the North," Chiang Mai is the largest and most culturally significant city in northern Thailand. Thailand's beautiful beaches often distract newlyweds from the beautiful north, however Chiang Mai is increasingly gaining clout as a precious and inspiring honeymoon destination. With gorgeous hot springs and caves found throughout the mountain ranges there is plenty to explore on a trek around Chiang Mai. Clean air, open expanses of lush forests, and a tranquil mountain ambiance all combine to create a serene romantic honeymoon environment. A myriad of hotel options are available, many of which are secluded from the city in charming mountain areas that are intimate and accommodating. 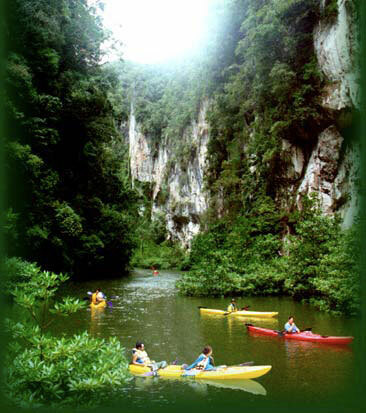 the treks themselves can take up to 5 or 6 days and will see you journey deep into the Thai jungle. Some of the Kingdom's most beautiful scenery and vegetation will get you back to nature. Chiang Mai's charm is relaly in the natural aspect. This vibrant beach town offers beautiful beaches, lavish resorts, and non-stop entertainment. But our suggestion is to avoid the big hotels and find a quiet spot down on the water. Along the smaller beaches are strings of Thai wooden bungalows set in dense tropical gardens. These offer an absolutely perfect setting for romantic honeymoon evenings. 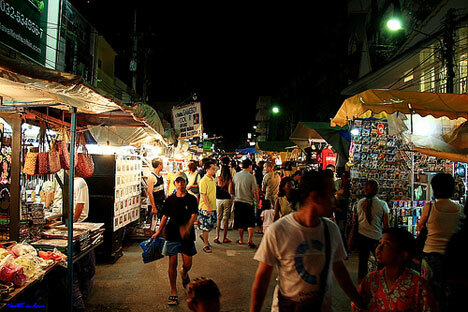 Modern Pattaya is developing a thriving nightlife at the moment. But there's something very calming about retiring to a private beachside bungalow and waiting for the sunrise over the pristine white beaches. Relax with a Thai massage right there on the beach under the shade of the coconut palms or sample the snacks on offer from the wandering vendors. 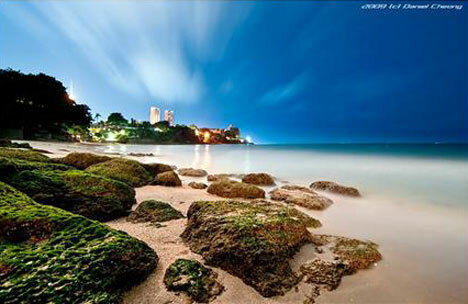 Known as the Emerald of the Andaman, Phuket is a world-renowned honeymoon destination. The pulsing nightlife and stunning views around the island make this one of the most visually stunning places in Thailand. Mountainous forests are fused with white beaches are the perfect backdrop for this party town. Street performances, plays and a whole host of exotic cultural opportunities are available until the early hours of each morning. But our favourite activity would be the cabaret. A spectacular display of colour, originality and fun. Phuket's Simon Cabaret has become one of Southeast Asia's outstanding entertainment attractions, drawing a thousand enthused visitors from around the world each evening. It's over the top, it's loud and it's very much in your face. 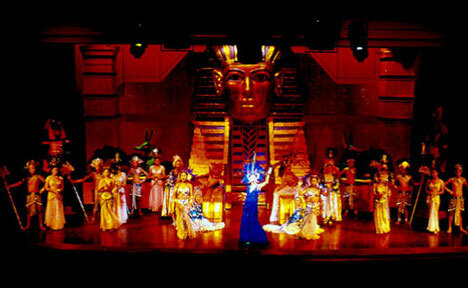 But the Cabaret in Phuket is a must-see on your honeymoon in Thailand! 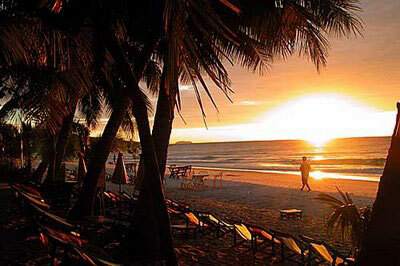 Hun Hin has a convenient blend of Thai and Western style accommodation. Towards the edges are some lovely romantic villas that run along the shore of the fishing town. These offer visitors dozens of secluded romantic spots. Hua Hin is much less developed than many of the major tourist centres so there's a real sense of culture here. The night markets are simply amazing. Cultural products from around the region flow in daily. The fishing market also has fresh-caught seafood right off the boats. Tours are even available that let you unload boats and smaple the produce right out of the water. Being less developed you'll also be less of an interest to the locals here. This isn't a tourist town, which makes it perfect for honeymooners who want to get some space from the regular touriost routes. With towering columns of ancient limestone rock shooting out of the turquoise waters, Krabi is perfect for honeymooners on a budget. Krabi features some of the most impressive physical land features in Thailand, all surrounded by lush rainforests, calm seas, and world-class reef diving sites. A wide array of hotels and resorts line the shores of Krabi, providing newlyweds with plenty of romantic hideaways in the shadows of primitive formations. The best way to explore these amazing limestone structures is by sea kayak. Take a paddle together and enjoy the sunshine and the scenery. You'll find that the best spots in and around the Krabi coast are not in guide books. Ask the locals or simply paddle around and find that perfect strip of white sand for a romantic afternoon oni the beach. This small island is ranked by many as one of the most beautiful places in the world. Towering cliffs, crystal clear water, and silky white sand beaches encapsulate this tropical haven, providing visitors with a memorable holiday atmosphere. If you're an ocean-going couple you'll have a blast in Ko Phi Phi. The waters have dozens of world-class diving spots, a myriad of national parks and even plenty of shallow reefs that are teeming with exotic tropical wildlife. A popular weekend getaway for Thais and foreigners alike, Ko Samet is a glorious collage of gorgeous beaches, posh resorts, and interesting cultural attractions. This is where bustling nightlife meets tropical serenity. By day the beaches and parks are a convenient walk, ride or drive from the main towns. Newlyweds will appreciate the tranquilty that comes with getting just outside the city. But during the evenings the capital city comes alive! Dancers, colours, fireworks displays and pumping music fill the atmosphere with energy. If you're party goers, Ko Samet is a great stop to dance the night away or party hard and stroll home early. the oppoirtunites are really up to you. Ko Samet has so many choices of activities that its probably one of the best all-round honeymoon destinations in Thailand. Thailand does have an amazing coastline. 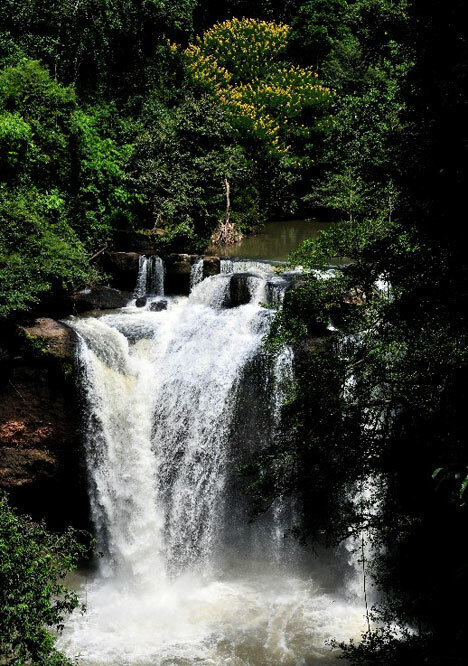 But all too often, honeymooners can forget the less traveled national park, situated northeast of Bangkok, Khao Yai. This a stunning compilation of beautiful mountain ranges, unspoiled forests, and engaging recreational activities. Sporty newlyweds that prefer nature to the more common tourist towns will find Khao Yai to be a tranquil haven of romantic bliss. January-March is the best time. It's dry and it's warm, especially from February onward..
Summer and Fall are wet. Really wet..
You 'll need a professional agent. Thailand is not quite as plug-and-play as, say.. London would be.. Work with someone who knows Thailand. Find a honeymoon specialist near you..